Our extensive air conditioning training offers everything from service and maintenance to installation and commissioning. The F Gas Regulations, make it illegal for any person or company to recover HFC refrigerants without being certified as competent. It is a legal requirement therefore to hold a certificate in Safe Handling of Refrigerants for anyone wishing to recover or charge, with refrigerant, any type of air conditioning system. The F Gas Regulations went further in July 2008, making the installation of air conditioning equipment illegal without this refrigerant handling license. There is no exemption, regardless of the size of the company! 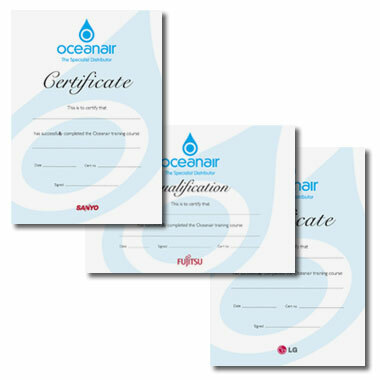 Oceanair are now able to provide both certification and qualification certificates when you successfully complete one of our training courses. With certificates for Panasonic, Fujitsu and Daikin training courses your portfolio will be suitably boosted! With the rapid development of modern heating and cooling products, Panasonic UK recognise the need for constant training and up-skilling of Design Engineers, Contracts Managers, Installation and Commissioning Engineers. With this in mind, we have developed a comprehensive training structure to provide all our industry partners with the knowledge base to properly select, install and commission our solutions. To implement this we have developed a broad range of training courses covering areas from basic equipment theory to the more in-depth subject of system selection, design and commissioning. To check the cost and availability of any courses please contact Oceanair directly by emailing training@oceanairuk.com. This course is aimed at employees of our industry partners involved in the installation/commissioning of split systems in the capacity range 2.5 Kw-25Kw. This course is aimed at the Design Engineers and Contract Managers who either design or manage the installation of large VRF projects. The course is designed to give the attendee a full understanding of the operating characteristics of Panasonic VRF systems and their associated indoor units. For more information download our PDF. This course is aimed at the employees of our industry partners who are responsible for the installation of large VRF projects. The course is designed to give the attendee a full working knowledge of the requirements for installing Panasonic VRF heat pump and heat recovery systems. This course is aimed at the employees of our industry partners who have successfully completed VRF 1. This course will cover in-depth commissioning procedures focusing on system operational control. This course is aimed at the employees of our industry partners who are responsible for the installation of large GHP VRF projects. The course is designed to give the attendee a full understanding of the operating characteristics of Panasonic GHP VRF systems. This course is aimed at the employees of our industry partners who have completed GHP 2 and who are involved in the service and maintenance of GHP VRF systems. The course is designed to give the attendee an understanding of the GHP outdoor PCB functions and optional settings. This course is aimed at the employees of our industry partners who are involved in the design and selection of Air to Water heat pump systems. The course is designed to give the attendee a full understanding of the principle of Air to Water heat pump operation and the basic requirements for the design and selection of the correct heat pump for a given installation. This course is aimed at the employees of our industry partners who have completed A2W level 1 and who are involved in the installation, commissioning, service and maintenance of Panasonic A2W heat pump systems. The course is designed to give the attendee a full understanding of the commissioning and maintenance procedures for Panasonic A2W heat pumps along with knowledge of fault-finding procedures. Fujitsu have developed specific courses, created to make you much more fluent in designing and installing Fujitsu air conditioning. The courses have been conceived to help develop and deepen your knowledge of Fujitsu’s products, their benefits and their ideal applications. On top of that the courses cover the after-sales and service skills that will only enhance the benefits that installing Fujitsu air conditioning brings. Fujitsu are committed to training to help raise standards throughout the industry and have invested heavily not only in the headquarters in Elstree but also a number of training facilities throughout the country so that you can pick a location convenient to you. All courses are taught by highly skilled engineers who between them have many years experience working with Fujitsu products. All courses are free of charge and each delegate receives a certificate on completion. Below is an overview of the courses available. To book a course simply complete the training request form and return to training@oceanairuk.com. Designed to raise standards, set industry benchmarks and help you develop both product and service expertise. You’ll receive the highest quality training and hands on instruction at industry leading technology centres. Courses are available to attend at Bristol, Woking, Birmingham, Manchester and Glasgow. The regional training centres are fully equipped with the latest range of products, installed and fully operational for maximum hands on experience. Details of courses and the availability can be found at https://training.daikinuk.solutions/. Oceanair customers are eligible for free training so email us at training@oceanairuk.com with the course details and we will ensure you don't have to pay to attend. Everything you need to know about installing R32 Systems. For installation, commissioning and service engineers with refrigeration and safe handling knowledge.